This independent range hood buying guide will help you choose a new range hood in an easy to understand step-by-step fashion. If you're interested in getting a new range hood but you feel overwhelmed or you don't know where to start, this free range hood buying guide will provide you with everything you need to know to make an informed decision. All you need is a tape measure, a piece of string, and pen & paper. Are you bad at math or don't feel like putting in the effort? Good news everyone: to make your life easier, we have created a FREE PDF to accompany this range hood buying guide. Don't worry, you won't even have to print it out. Just type your answers directly in the PDF's required fields on your computer and it will automatically do all the hard work for you! It doesn't get any easier than that, as it will let you skip all the math in this guide. When you're finished, it will become a handy overview of all the essential information required when deciding which range hood to buy. Click the button below and receive the free PDF by email. When you come across this green box during this guide, it means that you should refer to the PDF and answer a specific question through placing a check mark or type an answer. The first step in this range hood buying guide will be about making a very important decision: you're going to choose between a ducted or a ﻿﻿ductless ﻿﻿﻿﻿range ﻿﻿hood. Below you will find short ﻿descriptions on both, as well as their pros and cons. get transported through this duct and out of your home through either your roof or a side wall. Performance wise, ducted range hoods are far superior to ductless range hood, simply because they're able to take all of the smoke, oil and smells, and transfer them out of your house. Aside from not cooking at all, ducted range hoods are by far the best way to make sure you are left with a pollution free kitchen. Q. If ducted range hoods are better, why are there ductless ones? Not every home will be able to or even allowed to use a ducted range hood. The most obvious reason will be the lack of a duct in your kitchen. Don't buy a ducted hood if there's no duct or vent present in your kitchen to connect the range hood to. Another common reason preventing people from using a ducted range hood is that the law will prohibit them from having a duct in their home which exits outside of their home. Although some people might have the urge to install a new duct in their kitchen so as to avoid having to sit in smell of food, be sure you're allowed to do so. Certain apartments or condos are prohibited to have anything penetrate their outside walls. For example, if the exterior of the building is mostly made out of glass, it's probably not a great idea to drill a hole in it for your duct. Do not let your duct end in an enclosed space like your attic. Also, do not hook up your range hood to either your Heat Recovery Ventilation (HRV) or Energy Recovery Ventilator (ERV), as there will be a grease build-up inside. Ductless range hoods are also known as non-vented range hoods, non-ducted range hoods, duct free range hoods, and recirculating range hoods. As the term gives away, ductless range hoods aren't connected to a duct. Like their ducted brothers, they will capture odors, oils and fumes, and pass them through a filter. Q. 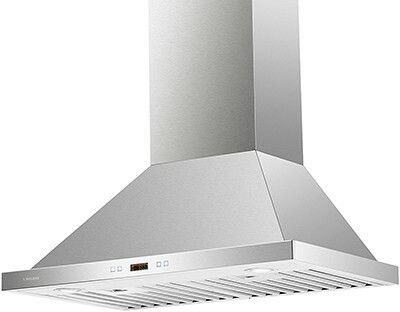 If I can’t have a ducted range hood, should I not get one at all? If you have a choice between buying either a ductless range hood or none at all, we strongly recommend the former. Although ducted range hoods are generally superior to ductless range hoods, having the latter is still much more preferable to having none at all. Why? Chances are you will pan fry or sauté something in your kitchen. While doing so, part of the cooking oil will go airborne. 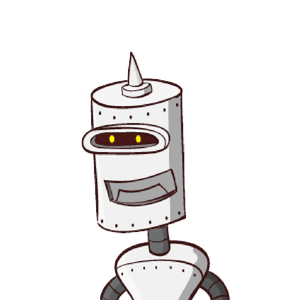 Without any range hood installed, these fine, aerosolized oil particles will have free reign to spread and stick to everything in the near vicinity. This will leave you with sticky, unhygienic, and smelly cabinets and surfaces. They are these hard-to-clean yellow stains. Ductless range hoods will capture the lion's share of these oil particles and pass them through a charcoal filter and/or an aluminum mesh filter, which will prevent your cabinets from being covered in this gummy residue. Depending on the specific filter in your duct-free range hood, it might even capture some of the cooking smells. 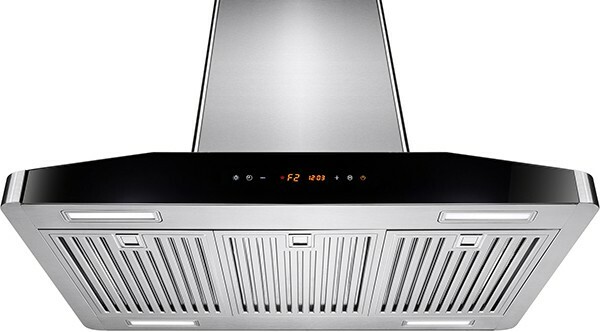 So, if you plan to do more than boiling an egg, do your future self a favor and get a range hood. Even if it means getting a﻿﻿﻿ ﻿﻿﻿﻿ductless﻿ one. See how happy this fake couple is with their new range hood? This could be you! Please take the sticker off though. Question 1: Open your PDF and navigate to the first question. There you will have to choose between a ducted and a ductless range hood by putting a check mark next to your choice. If you're planning on buying a ducted range hood, you will generally have a choice between either an aluminum mesh filter or a baffle filter. There aren't a lot of ducted range hoods which contain activated charcoal filters, as these filters are meant to trap pollutants like odors and smoke. Since ducted range hoods will transport these pollutants out of your home, having a mesh or baffle filter installed will suffice. However, if you're opting for a ductless range hood, you will have the option for an activated charcoal filter. 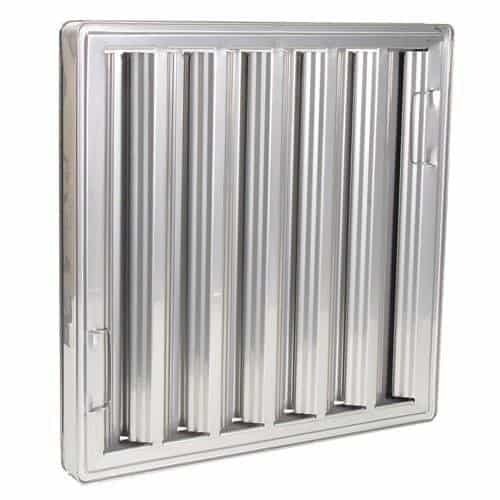 If you're planning on buying a ductless range hood, we at Rangehoodguide.com strongly recommend getting one with a charcoal filter. The activated charcoal in these filters are used to trap the cooking smells, as impurities are attracted to the carbon-based compound. A lot of these filters will also include a layer of felt. This felt helps in capturing the smoke resulting from (pan) frying and cooking. Aside from the charcoal filter, certain range hoods might include an additional filter mesh or baffle filter to capture the grease. the sucked up air will be recirculated back into your kitchen. As aluminum mesh filters cannot filter out smells and smoke, they will also be recirculated back into your kitchen. Not pleasant to say the least. Among all three types of filters, aluminum mesh filters are generally the filters which need to be cleaned the most. 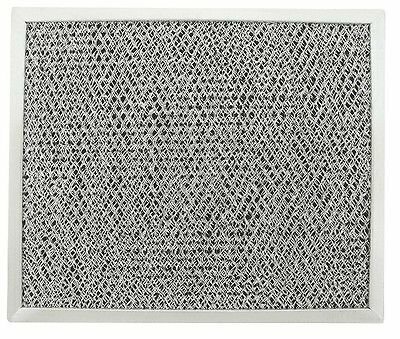 Similar to the aluminum mesh filters, baffle filters won't filter out smoke or cooking smells. Baffle filters will only filter out oil particles. When these go airborne and enter the baffle filter, the curved design of the filter will force the fumes to quickly and repeatedly switch direction. Since the oil can't really change direction as quickly as air can, it will get stuck to the blades of the filter and will ultimately get deposited into an oil tray. Also similar to the aluminum mesh filters, baffle filters need to be cleaned regularly. Which filter do we choose? If you're going to buy a ducted range hood, you will have to make a choice between getting one with either a mesh filter or a baffle filter. If it were up to us, we would opt for the baffle filter. The baffle filter will generally require less cleaning (around once every 1-2 months) compared to the mesh filter (with heavy daily use, almost every week). 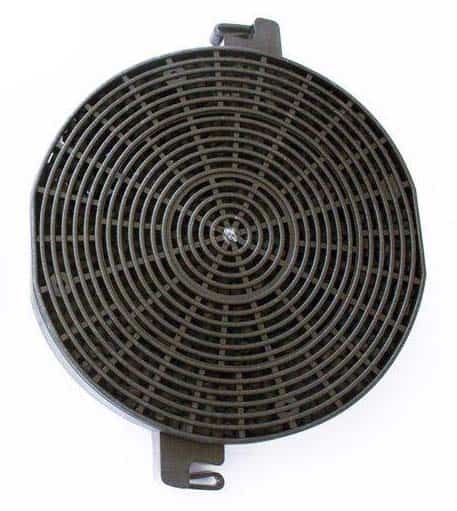 For ductless range hoods, the activated charcoal filter is definitely our number one pick. Charcoal filters perform much better compared to the mesh and baffle filters when it comes to filtering out odors, oils and fumes from the air. The trade-off is that charcoal filters aren't reusable, so you will have to regularly buy replacement filters. After a certain amount of cooking hours, usually 3-4 months worth, you will have to replace your charcoal filters. The mesh filter and the baffle filters, however, are both cleanable. Perhaps you should take a look at your current cooking habits, as well as the contents of your wallet. Will you be cooking and frying a lot at a high temperatures while using cooking oil? If so, then go for a ductless range hood with activated charcoal filters. If you mostly use your kitchen for boiling, poaching, baking or low-heat cooking, you might get away with having a baffle filter in your ductless range hood. If it’s a money issue and you’re looking for a cheap solution, go for the aluminum mesh filter, as they're generally less expensive compared to baffle filters and won't have to be replaced like charcoal filters. (click the big green button below). Question 2: Choose a filter and put a check mark next to your preferred filter on the PDF. Next page: What type of range hood? 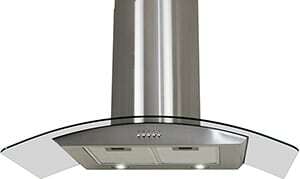 The next page of this Range Hood Buying Guide will cover the different types of range hoods. Since there are so many, it's easy to get lost in a sea of options. Let's take a look at the most common ones and pick one which is right for your and your situation. ​When installing your new range hood, make sure you have the right tools for the job. 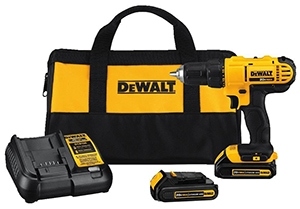 This bestselling compact and lightweight DEWALT DCD771C2 drill will ​definitely get the job done! 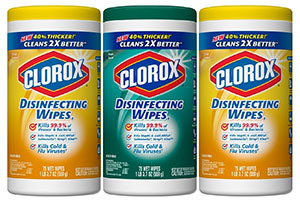 Make sure your kitchen is squeeky clean and disinfected at all times with these bleach-free Clorox scented wipes. Clorox multipurpose wipes will kill 99.9% of bacteria and viruses and remove common allergens around your home. 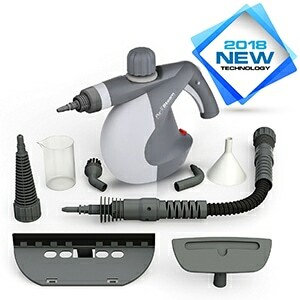 When it comes to cleaning your range hood filters (and almost anything else), nothing will beat a steam cleaner. Simply fill it with water and steam away all the impurities in your kitchen, bathroom and the rest of your house. 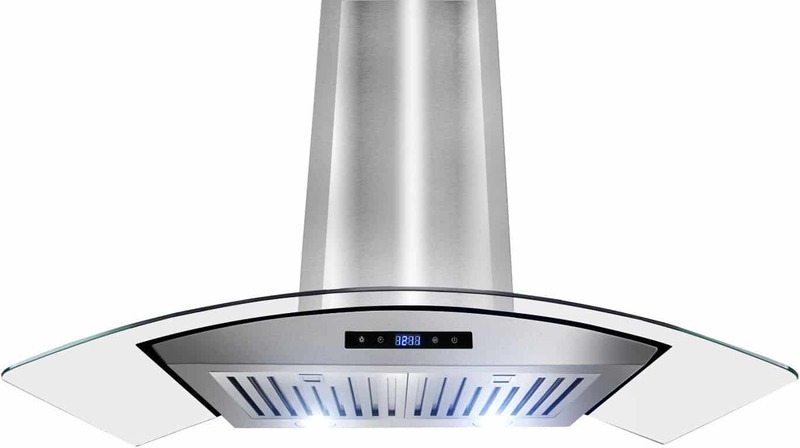 If you own a cooking island and are looking for a range hood, check out our 2018top 5 best island range hoods on the market.